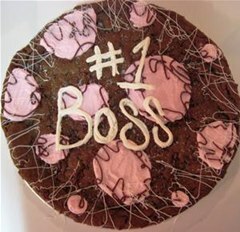 Boss's Day is on October 16th, and this year it falls on a Saturday— what better of a day to celebrate Boss's Day? More than likely, you won't be working in the office this weekend, and if you are, you probably don't feel like celebrating and thanking your boss for being so kind and fair. So, forget the cake and ice cream and instead, take the chance to develop a good relationship with your boss, because hating or kissing up to your boss just isn't the way to go. Thomas J. Zuber, MD, and Erika H. James, PHD, have written a great article, nearly a decade ago, that still applies today, in learning to manage your boss. The article appears on the American Academy of Family Physicians (AAFP) website, but rest assured, you don't need to be in health care to take advantage of this great advice. "You can hate your boss, kiss up to your boss or learn to manage your boss. Only one of these options is worth it for everyone in the long run." If you can't manage your boss well, communication problems lead to frequent misunderstandings about your overall job, and furthermore, career progress and satisfaction rarely occur. It's said that the primary duty of all employees is to have a successful relationship with the boss. Great organizations rely not only on dynamic leaders but dynamic followers. Managing up means being proactive but not presumptuous, supportive but not sycophantic with your boss. Although it requires great patience, emotional maturity and courage, managing up can improve your organization, your job satisfaction and your boss. If you're interested in maintaining a good relationship with your management, then click through to read the full article. 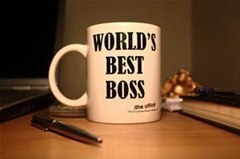 If you want to celebrate National Boss Day in a more selfish way, check out the videos below for learning how to get a raise, communicating with your boss and telecommuting. Click above to see the rest of the videos in this series. ** Cake photographs taken from More Than Chocolate by Lauren Lust.